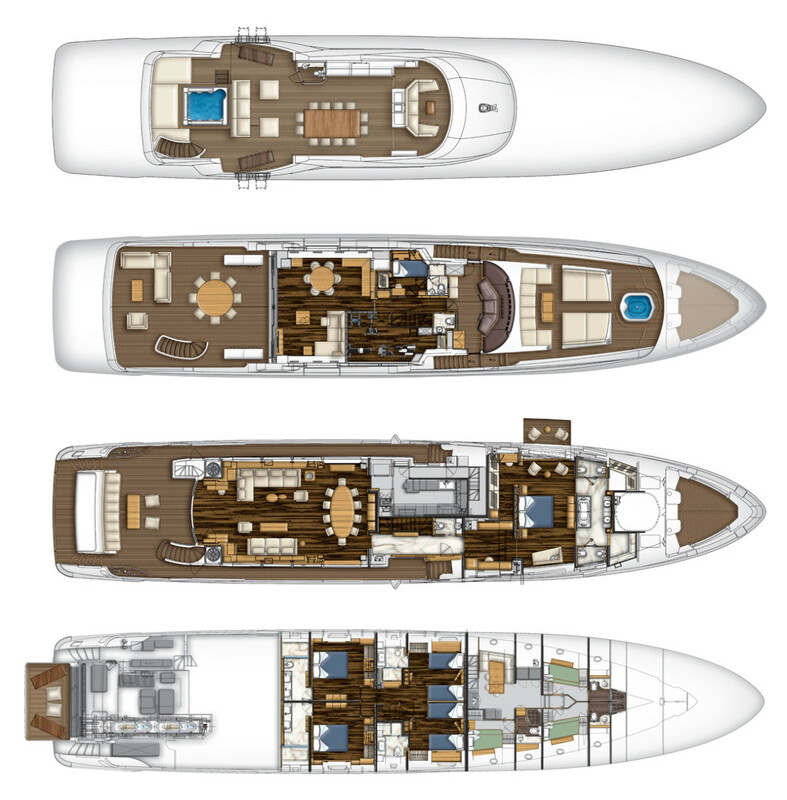 Every yacht has a defining feature, one that illustrates her true personality in an instant. The French have a good phrase: raison d’etre, or reason for existence. In the case of the new Benetti Classic Supreme 132, I discovered it on the main deck as I wandered about admiring the yacht. But more about that in a moment. You have to love the Italians. 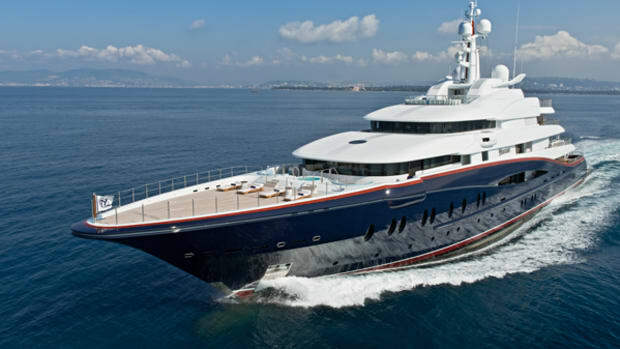 If one descriptive word is good, then two are always better, hence the model name of this yacht: Classic Supreme. Overkill perhaps, but charmingly Italian. It reminded me that the largest and most powerful Ferraris of the 1950s and 1960s were called Superfast. As if we didn’t know. In this case, the Classic Supreme 132 is the newest of the Benetti Class yachts, which range from 93 to 145 feet (28 to 44 meters). 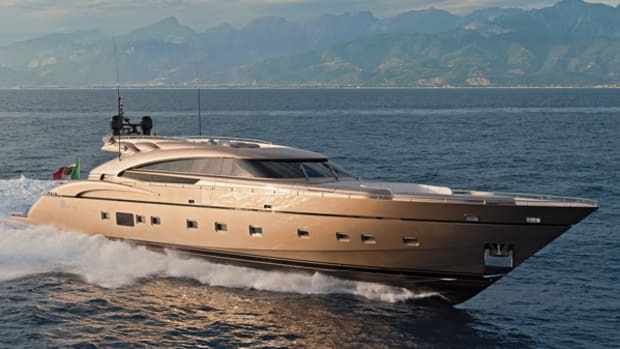 The Class series is intended as a semi-production motoryacht that draws heavily on the DNA from the Benetti Customs and, I have to admit, she is both classic and supreme. But if you really want to capture what this Benetti is all about—her raison d’etre—stroll the length of the main deck forward to the owner’s suite, which spans the full beam of the yacht, plus some. It is that “plus some” that defines her so aptly. You see, the entire port side of the stateroom pushes out at the touch of a button, creating an alfresco balcony with a teak-planked sole and a pair of comfortable chairs with a table. It struck me as the most wonderful spot to enjoy a cup of coffee on a fine morning, perhaps with a flaky croissant, while admiring the scenery in Portofino, Saint-Tropez, Nantucket or wherever you happen to be at the moment. And the sheer unadulterated joy of fresh air and the outdoors neatly summarized the essence of this new Benetti. This is not a yacht for frigid climes, not with a big spa on the foredeck and another (two spas, no waiting) on the sun deck. Not with open-air dining tables for 10 (coincidentally the exact number of guests) on both the sun deck and upper deck, which would be lovely for dinner on a warm evening, stern to the quay. Not with gracious outdoor living rooms with couches and chairs on, yes, every deck. 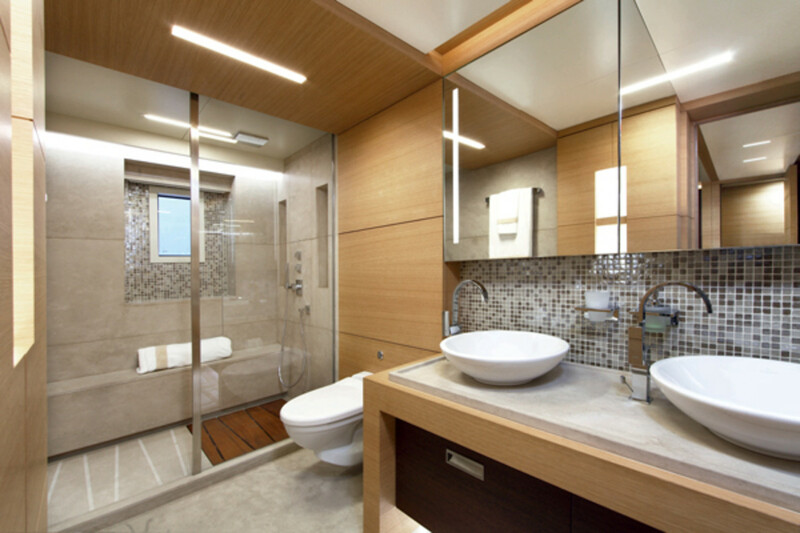 Even the fold-down transom “beach” is fitted for umbrellas and chaises. 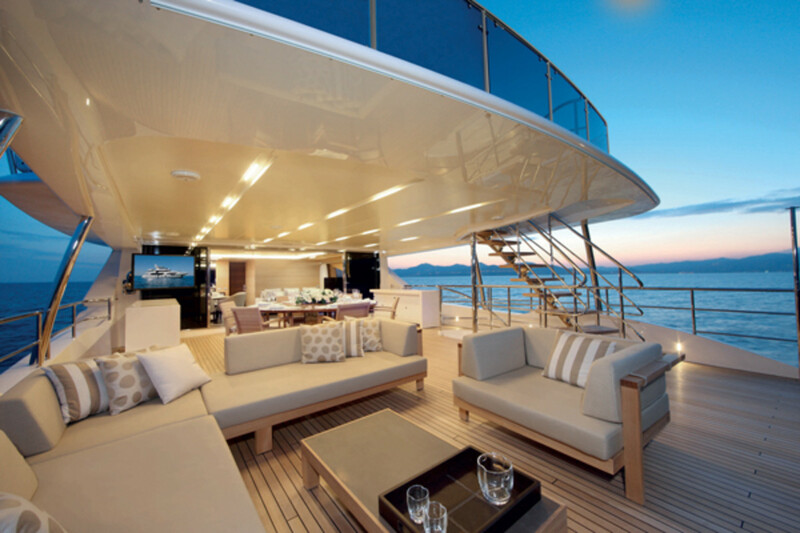 No, this is a yacht all about shaded outside living areas, and windows large enough to bring the outdoors in. There is, of course, a formal dining area on the main deck for those times when you don’t want a breeze to blow out the candles on a birthday cake. And there are wonderful interior conversation areas on both the main and upper decks for when the only zephyr you want comes from the discreet air conditioning. But the outdoor areas are only part of the story of the Benetti Classic Supreme 132, because designer Stefano Righini didn’t stint when it came to getting light inside. 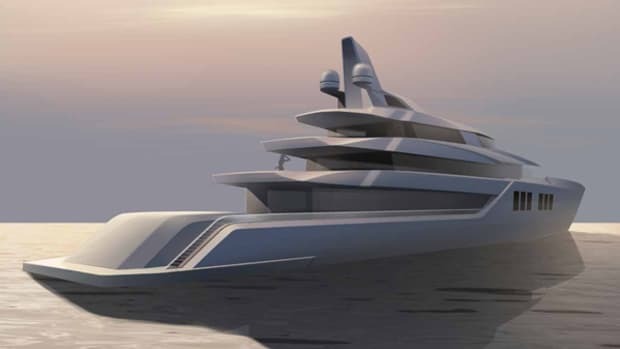 Just look at the yacht’s profile. There are big windows helter-skelter everywhere. And interior designer François Zuretti took the hand-off smoothly from Righini and created an interior that takes full advantage of all that glass to make every space, from the salon to the guest cabins, bright and airy. Sitting at the game table in the skylounge-ish upper deck with windows that drop to just inches from the sole, you couldn’t be more open in a New York loft penthouse. In the salon, the windows disappear behind the couches, giving a view even if you’re scrunched down. 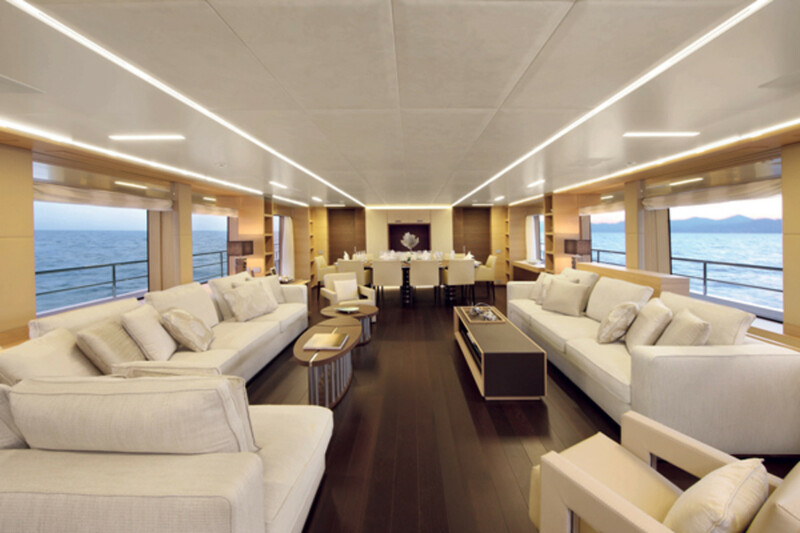 There are some thoughtful design touches that you might miss unless you study the plans carefully, such as the full-beam and full-length upper deck, which takes advantage of the 27-foot (8.2-meter) width to provide shade for the walkways around the main deck while keeping the salon cool. And that push-out from the master? It’s on the port side, since most skippers prefer to dock starboard-side-to, which is also the side where the entry foyer is located for arriving guests. Even alongside a pier, the owners can enjoy their private balcony. But the delights just keep coming. That transom beach? It conceals a garage that is, in Italian, assolutamente enorme. Absolutely huge. It is large enough to absorb a Williams Dieseljet tender that carries nine. And there’s still space for a pair of personal watercraft. And a work room. And storage for dive gear. 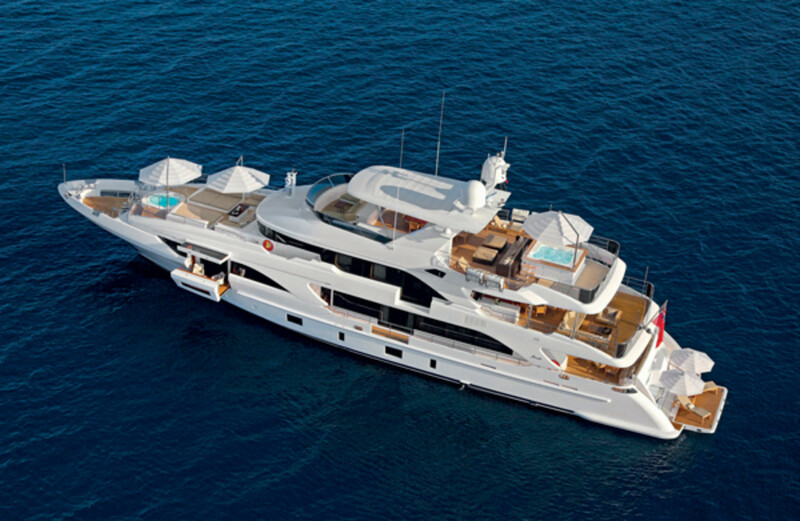 The owner’s suite, like the rest of this Benetti, makes good use of the beam with an entry area that doubles as an office, a walk-in closet and his-and-hers bathrooms joined by a common area with bath tub, separate shower and dual vanities. 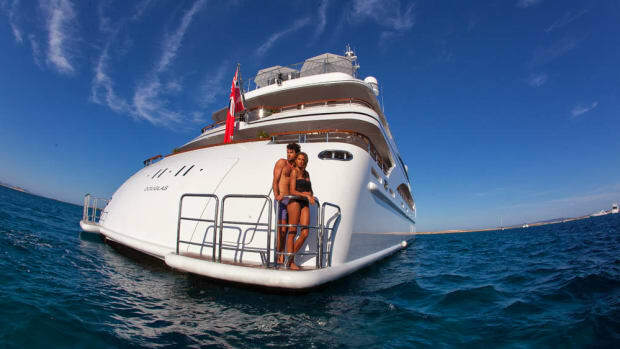 Guests on the lower deck have it nearly as good, with a mirrored pair of VIP staterooms aft, each with desks and tiled heads with large showers and vessel sinks. 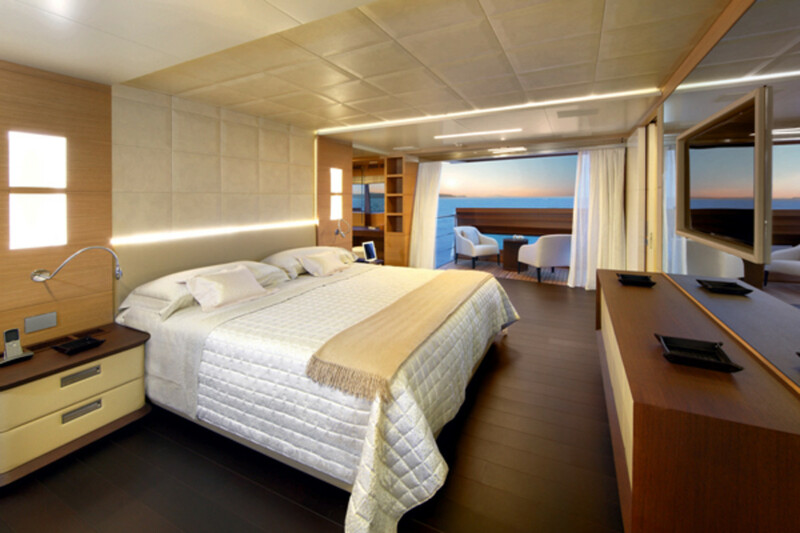 Forward of the foyer are a pair of guest staterooms with twins, also with stylish ensuite heads and showers. 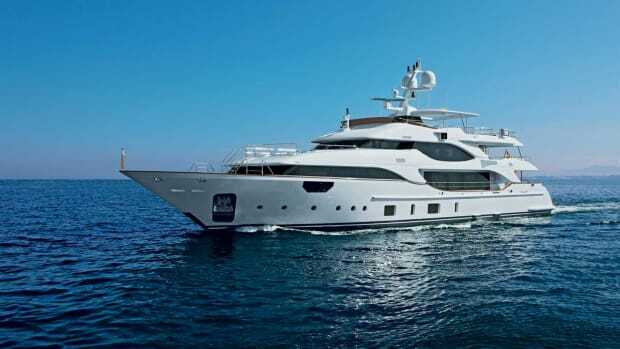 And, since a happy crew makes for a happy owner, it’s likely the owner of a Benetti 132 will live in ecstasy, since the crew quarters are very un-European with their large size and civilized finish. The captain has his own aerie just abaft the pilothouse with a private head and shower, and the crew of six shares three private staterooms, each with head and shower. They open to a common crew mess with dinette and mini-galley and, via stairs, have direct access to both the galley and the side deck. That crew certainly includes a chef capable of the finest cuisine, because the owner of the first 132 specified a gym on the upper deck to keep the waistline under control. This area includes a head with shower and hanging lockers for a change of clothes, plus a massage table for those achy muscles. If your guests are feeling, ummm, unsociable, or if they just want to curl up with a good book, there is a multitude of private areas to which they can escape. On the upper deck, just forward of the cantilevered fiberglass hardtop (with its opening sunroof), there is a wraparound couch behind the venturi. Another getaway, and one that would be lovely at anchor, is on the foredeck where another couch and cocktail table are just behind the big sun pads and the forward spa. I may jest about the Italian propensity of ornate names (Classic Supreme, indeed), but they have an easy familiarity with fine woods, leathers and stone. 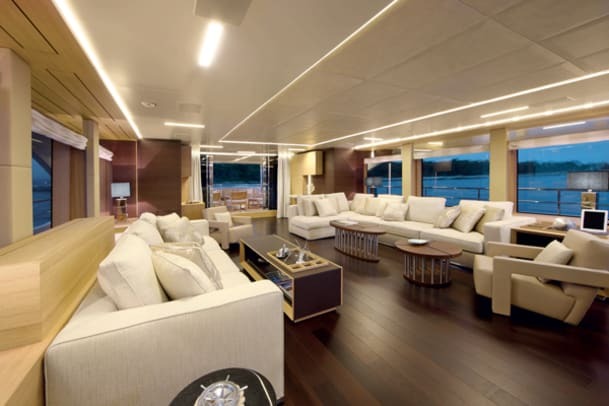 Each owner works with designer Zuretti to personalize his or her yacht and, in the case of the first 132, the owner went with a subdued and minimalist look using pale oak with wengé accents and leather wall coverings so supple you want to stroke the bulkheads. While the Italians may use age-old methods with woods, leathers and stone, they have fitted the 132 with their BEST technology (Benetti Exclusive Sea Technology), a sophisticated design that literally melds all the onboard electronics and systems into one integrated unit. The BEST package links the many systems, ranging from televisions to light switches, telephones to radar, into a single network infrastructure that speaks the same language. Combined with the new Apple AirPlay system that allows mobile devices (iPhones, iPads, iMacs) to connect via Wi-Fi, BEST turns the usual Tower of Babel electronic systems into a user-friendly package. The 132 is no slouch when it comes to power, either, with a pair of MTU 12V 2000 M72 diesels punching out 1,450 horsepower. 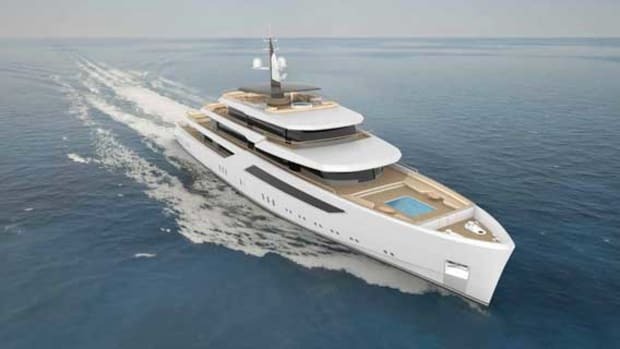 This gives the yacht a hammers-down speed of 15.5 knots, a comfortable cruise at 14.5, and a transoceanic range of 3,500 nautical miles at 12 knots, according to the bujilder. 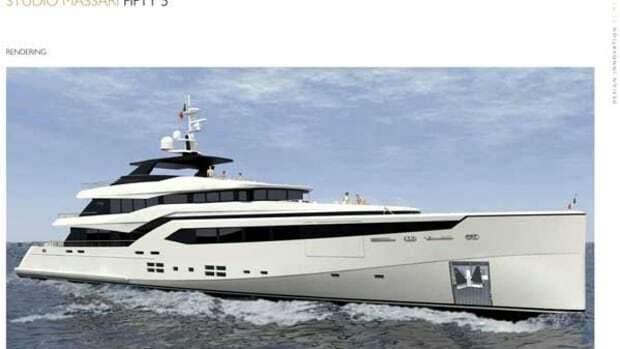 The electrical side is handled by twin Kohler 80kW gensets, and the yacht has at-anchor Naiad VT stabilizers. The Benetti Classic Supreme 132 was the first launch from the Lucca Dockyard, a new facility next to the longstanding Benetti yard in Viareggio. 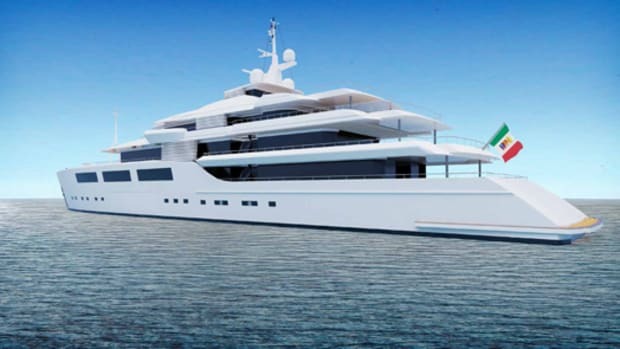 This shipyard will be devoted to the Benetti Class series of yachts and is large enough for simultaneous construction of three 140-footers, thus allowing the entire line to be built in Viareggio. 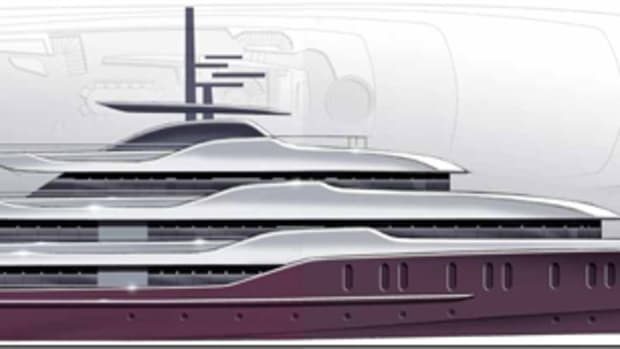 With fully composite construction, of course, the 132 is built to RINA classification and she can also be built to meet MCA LY2 (Large Commercial Yacht) class as an option. Like a tongue returning to a loose tooth, I couldn’t stay away from the owner’s suite and, specifically, that push-out balcony. Eventually I gave in and sat in one of the comfortable bucket chairs. If I squinted my eyes just right, I could imagine Bellinis in two fluted glasses on the table. And with a little more squinting, I was looking up the St. Barths hillside at the red roofs of Hotel Carl Gustaf in the distance. Or was I seeing the distant hilltop village of Eze from Cap Ferrat? No matter. I had found the essence of the Benetti 132, and it is wonderful. Super Wonderful, as the Italians might say.